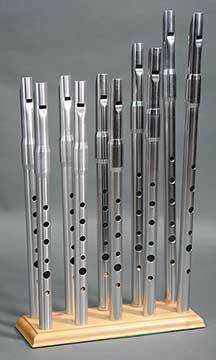 Tilbury Whistles are Irish style whistles made in the U.S. by Chuck Tilbury. They’re built from aluminum alloy; headjoints use a delrin plug with a curved windway. Tuning slides use rubber o-rings. Holes are slightly larger than commonly found to allow easier half-holing. The result is a quality Irish whistle at a reasonable price. Chuck Tilbury’s latest design is quick, responsive and requires considerably less air than his earlier whistles. These whistles also now have a polished finish. $75 each. To Order: Call 608-255-2254 or E-mail us. Shipping within the U.S. is $7.95 per whistle. Shipped via USPS Priority Mail. For great, modestly priced and easy to recommend first whistles, we carry also Clarke Sweetone Penny Whistles, Clarke Meg Penny Whistles, and the Clarke Original Penny Whistles.